Brezhnev’s War: NATO vs. the Warsaw Pact in Germany, 1980 enables two players to game the first month of a hypothesized communist invasion of Western Europe sometime between the fall of Saigon and the start of the Soviet intervention in Afghanistan. It was during that period the conventional “correlation of forces” between the two hostile alliances most favored the communists. The scenario portrayed is the one that was most anticipated and feared by NATO’s intelligence analysts at the time. That is, despite their knowledge of the existence of Soviets plans to begin such a war with massive chemical and nuclear strikes, the West’s military planners gave those schemes little credence. They knew the Soviets understood such a strategy would bring on immediate nuclear retaliation by the West. That would’ve ended the war as quickly as it began – mostly likely along with all of civilization – with no winner identifiable. What was feared then was, one fine summer day, the Soviet units in East Germany would move out from eating breakfast in their mess halls and roll across the border into West Germany. It would’ve been a “come as you are” kind of war, the aim of which would’ve been to blitz across Germany – using only conventional weaponry – in under a month. The Soviets would then have called for a ceasefire before any nuclear or chemical weapons had been detonated or the massive economic power of the Atlantic community brought to bear. With that, West Germany – the geo-strategic lynchpin of NATO in Europe – would’ve been neutralized and its Ruhr industrial area – then as now, one of the most important manufacturing centers on the planet – entirely wrecked. That would’ve caused a shift in the global balance of power in favor of the Kremlin, setting them up to deliver the knockout blow later. The 50” x 35” map covers the core area of the Federal Republic of Germany at 6.66 miles (10.8 km) per hex. There are 352 large-size (5/8”) unit counters, representing the divisions and brigades immediately on scene at the time, along with the masses of other units that could’ve been sent as reinforcements. Each of the 10 game turns represent three days of real time. The turn sequence uses the classic fight-move or move-fight structure. 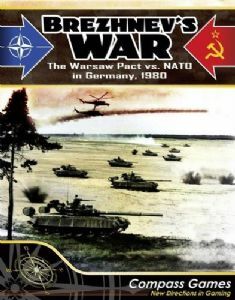 Special rules account for heliborne units, Spetsnaz, the ultra-elite Soviet Eighth Guards and Guards Airborne Armies, East German and Czechoslovakian disloyalty, ranged Soviet artillery divisions, air power, supply, the criticality of Frankfurt for US operations, paradrops, German territorials, electronic warfare and variable Soviet victory objectives. The overall system is simple, at about 6 on the 1-10 scale. Two experienced players can get through a match in about four to six hours.